Today’s blog post is brought to you by the one and only Robert Nipper, a practical 3D applications guru who has also taught us how to repair a broken Crock Pot and build a basic holiday ornament. 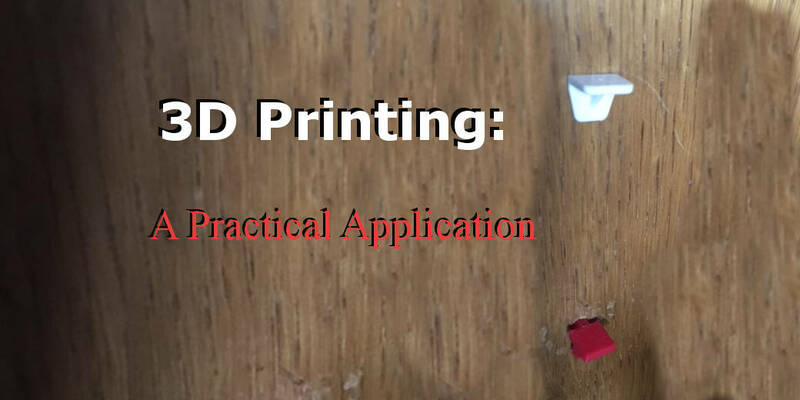 No Need to Run to the Store – 3D Printing Practical Applications. As I was on my way out the door this morning, my darling wife shared some information with me: “The shelf in the white hutch fell down. “ The white hutch is a catch-all piece of furniture that resides in the breakfast nook, housing everything from craft supplies to cookbooks to small hand tools and greeting cards. Imagine a junk drawer on steroids. I went to investigate with her. The shelf had fallen last night, and she had already done her best to triage the situation. I asked where the shelf was now. “Right there” she said. I then asked about the pegs that the shelf was resting on. She handed me two small white plastic pegs. Two. Just two. “There are supposed to be four of these” I commented. She informed me that there were only two, and asked if I could have it fixed before our neighbors came over for dinner. Since Christmas was just a couple of weeks away, we both had a full schedule. I didn’t really have time to go across town and look for replacement supports from the home supply store. The original peg on the left and the 3D printed version on the right. I took one of the two support pegs to the office with me and got to work. After applying a little digital caliper action to the peg, I determined its simple dimensions and sent the file off to the MakerBot. In a matter of minutes (yes, I do mean minutes) I was able to design and print four new pegs. After the print was complete we tested the pegs in a modular bookshelf here in the office, and they worked perfectly. I can’t wait to take my latest creation home and show it off to my wife, my family, and my friends! So much time and money saved! New technology to the rescue! So much coolness! I am the future! But…. My friend and co-worker Carlie just asked me if I checked with my wife before I printed them in red instead of white. OK, time to work on my “But red is a Christmas color….” response. Wish me luck. If you are interested in learning more about how you can save time and money with 3D printing, contact us at Spectra3D Technologies.